A football season has one or two monumental highlights, one of which is visiting The Valley home of Redditch Utd. However, this season the PRATS and all other Poppies supporters have been deprived of one of footies little luxuries. Sadly, their ground isn’t ready to host any games yet, although it should be noted that hasn’t stopped it in the past. The despair of missing out at playing a game at this marvellous home of unfettered hospitality has clearly affected our players. Once the news filtered through that we were now playing this fixture at the Oval in Bedworth their heads have significantly dropped, their ability to play footy has completely deserted them. The supporters are moaning at a considerably higher tempo than is the norm, they are also now moaning out of position with their mouths doing most of the talking instead of their arses, although there are one or two exceptions, well maybe more than one or two. Still, we have to make the best of a bad job and plan where we will indulge in a pre-match sup. So with Woodfarm brewery tap on route it would be remiss of us if we didn’t pop in. What will the Poppies do tonight, will we have a shot on goal, will we be drowning our sorrows or celebrating on the way home? 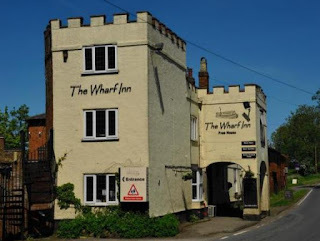 Where to go, we could return back to Woodfarm but maybe a small detour to the Wharf Inn at Welford might be in order. They usually have 6 or 7 ales and being a member of the Oakademy of Excellence they are bound to have at least one Oakham ale available. They are also in the Grainy Club so will have some Grainstore ales available as well. So despite the enormous disappointment we must overcome, we should have a half decent evening out.